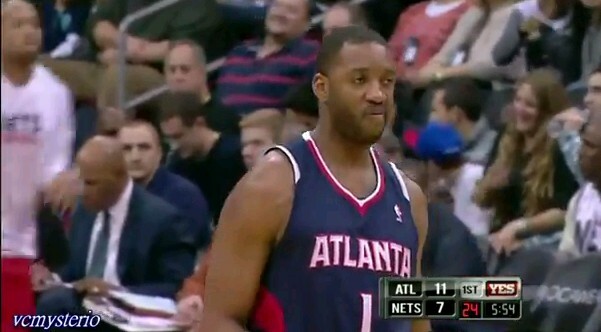 Tracy McGrady Is Back, Helps Atlanta Get A 4-1 Start In NBA 2011-2012 Season: The Scorer Is Back Beware! "Give me my second wind and I will not waste it." Who would have thought that the lazy eyed Tracy McGrady would rise once again after suffering several injuries that negatively affected his career. Those injuries left him unwanted, always on the trade block and they prompted the teams to offer him short contracts That's very disappointing considering that he's a 7 time NBA All Star and a former 2 time scoring champion. Aside from that, he's also a player full of history. Remember the 13 points in 35 seconds that he made against the highly favored San Antonio Spurs? Ohh, those where the days.... No one has topped that. He's in the perfect position right now to rejuvenate his veins while playing the second stringer role. He is in the city of Apple Pies, Atlanta Georgia. He is filling in the space that was left by the New York Native and the instant offensive player, Jamal Crawford who signed with the Blazers. Right now, T-Mac is playing great and that he's drawing some comparisons with the other latest stars and scorers of the NBA. Some fans are saying that he's finally back and that he's moving like Kevin Durant when he attacks the rim while others are saying that he's off the chain and that he's more attuned with his body and that he looks fit to be an all star again. Well, I believe that they are RIGHT.... I can't doubt that he looks better and that he looks nastier than ever. First, he scored 12 points against the Nets, then he had 11 points against the Bobcats and earlier today he had 16 points for the Hawks as they beat the unbeaten Miami Heat, 100-92. He's a heavy contributor in the Hawks' 4-1 start in this NBA 2011-2012 Season. He's getting better and better as the season progresses. Trust me, he's back! Watch his video below.